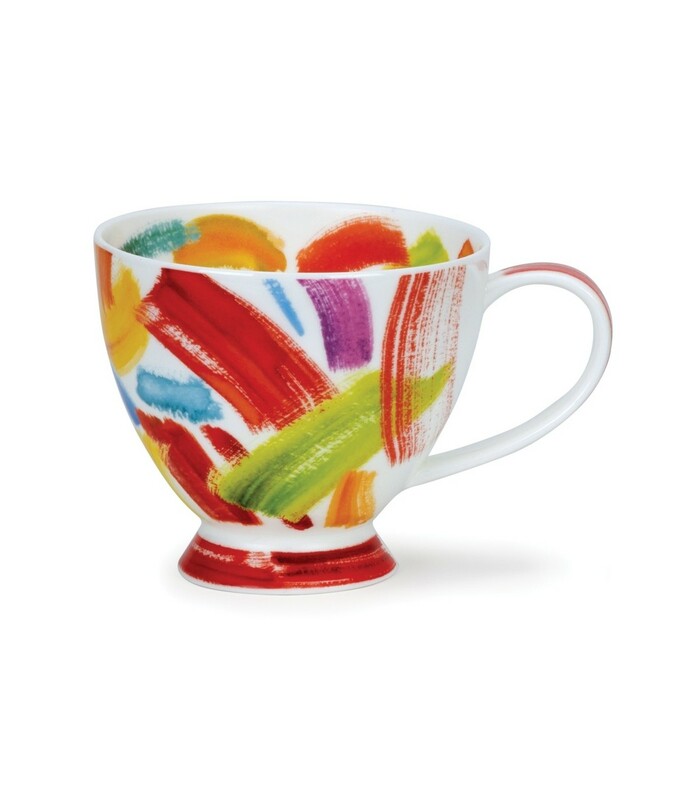 Featuring a lively abstract design by Caroline Bessey, this elegant cup is white and decorated with a pattern of multi-coloured brush strokes in a swishing style, as if applied by an excited artist! The bright colours are predominantly red, with lime green, pink and blue, and the strokes are repeated inside the rim and around the base. This is a lovely cup to drink from, whether or not you have an artistic temperament! Shaped like a traditional teacup, but much bigger, the Skye mug is a statement piece, nostalgic in shape with a capacity to hold plenty of coffee or tea. This oversized teacup holds 450ml, has a curving handle which is easy to hold and a sturdy footed base. Add an elegant touch to the tea table or your morning coffee with a Skye teacup mug. Caroline Bessey was born in Wigan, Lancashire and studied art, further specialising in ceramics at Lancashire Polytechnic, gaining a distinction award in 1986. Caroline is inspired by current trends and styles and has worked for Dunoon since 1987 and, although she is devoted to designing fabulous coffee and tea mugs, Caroline does not drink either of them!